Vibrato pedals are a twilight zone for a good portion of guitar players. If that was the full scope of mystique about this type of effect pedal, it would be fine. However, even the manufacturers mistake vibrato for a completely different, yet somewhat similar effect. Tremolo has been the main culprit when it comes to why vibrato pedals are not more popular these days. How Did The Whole Tremolo Confusion Begin? Why Are So Many Critical Of Vibrato Effect? How Do Vibrato Pedals Fit With Other Effects? How To Figure Out Which Vibrato To Get? Even though they operate in a completely different way, you will still see many pedals being marketed as vibrato, when they are actually tremolo, and vice versa. That is pretty funny considering that vibratos are among the oldest and most influential effects pedals there are. If you would like to check out what other effects fall into this category, check out our list for more information. We are going to go ahead and explain the difference between the two a bit later in the text. For now, we would like to introduce you to our top picks for this category of effects pedals. We did some research and found what we consider to be six best vibrato pedals. Our main criteria was overall quality of the product you are getting, so you may or may not agree with us. Either way, you can’t really go wrong with any of these models. On that note, let’s dig right in. Modern package that offers the incredible TonePrint tech along with great performance. Affordable vibrato stomp box that brings a performance outside of its league. Absolute best bang for the buck sweet spot pedal at the moment. A very impressive top tier vibrato box that brings true analog performance. One of few Boss elite models that delivers boutique grade vibrato effect. Among the oldest, and most respected legendary vibratos on the market today. There’s a lot of reasons why TC Electronic is currently killing it on the market. For the most part, their solid manufacturing process and an even better quality control, took care of establishing a proper reputation on the market. However, that’s not all. TC Electronic also included their impressive TonePrint technology into the TC Electronic Shaker Vibrato Pedal. The end result is a vibrato pedal that is more than capable in its factory condition. With that said, once you crank up the editor software that comes with it, and dial in some of your own parameters, things get extremely interesting. Along with its core performance, Tone Print technology has made TC Electronic Shaker Vibrato Pedal one of the best pedals of this type on the market, period. It’s not the cheapest model you can get, but it is definitely among those that have the most range to offer, and versatility that is miles ahead of most modern designs. Behringer pedals are not something you really look into unless you are either looking for an affordable pedal to test out the effect itself, or you’re just tied down by a very strict budget. Either way, more often than not, their effects pedals are going to bring an acceptable performance, and then some. Aside from a great line of affordable, but capable EQ pedals, Behringer Ultra Vibrato UV300 is actually one of their better cheap boxes at the moment. The thing comes packed with everything you can find on standard vibrato units of today, only Behringer chose to go with a more vintage type of effect. Think ’60s and ’70s kind of vibrato. Whether you are a fan of this specific type is completely up to you, but let’s make something clear – you won’t find a better cheap vibrato box than this one. Simply not possible. If you are between a rock and hard place, but you still want to get some vibrato going in your tone, we definitely suggest you check this Behringer out. It’s a heavy hitting little trooper. Alright, so you don’t often see a multi-functional pedal on the top list of anything. In most cases, such pedals are somewhere in the middle where they offer a good performance of each of their two effects, but not really anything you would want to write home about. 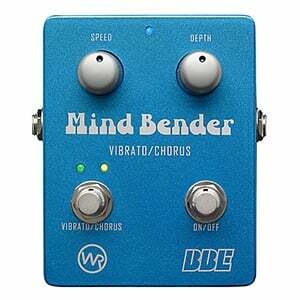 BBE Mind Bender Dual-Mode Analog Vibrato/Chorus breaks that rule, and brings a completely mind bending (no pun intended) experience to those in need of some sweet, sweet vibrato. This pedal’s main advantage, beside its dual personality, is the fact that it costs about half of what you would have to pay for a boutique vibrato pedal, while bringing a performance that is pretty close to one such pedal. All analog design combined with a sensible spectrum of both vibrato and chorus, make this unit a prime stompbox for those in need of a reliable mid range solution. In this price range, you won’t find a better deal. Now that we have worked our way through some of the more affordable models, let’s take a look at one heavy hitter elite unit that just takes vibrate to a whole new level of awesomeness. Diamond Vibrato – a pedal that bears a simple name, is also one of the most intriguing designs you can find under the vibrato umbrella. The whole thing is analog, but it uses a type of technology that creates very precise analog pitch shifting, giving you clinically accurate vibrato on demand. On top of that, it has a built in chorus feature that is a byproduct of its circuitry. It’s not marketed as a chorus pedal, but it’s definitely capable of giving you the type of effect that can go toe to toe with most modern chorus heavy hitters. True bypass comes as standard, along with a switch that lets you activate a darker type of vibrato, that is suitable for jazz or similar genres. In short, this is the type of pedal you might want to get if you got a bit looser budget to work with. Needless to say, the investment is very much worth it. Pitch shifting effects pedals, and modulation pedals in general, seem to be something that Boss is quite comfortable with producing. They always come up with fairly balanced solutions that bring a great combination of price, performance and overall quality. There is a reason why they are the staple brand for any aspiring guitar player out there. Boss VB-2W Vibrato is a very peculiar unit, since it is placed in a higher tier of pedals compared to where you usually find Boss products. This is also reflected by its price. The pedal comes packed with awesome features, and delivers a performance that is on the level of top tier boutique units. That is no exaggeration in any way. Boss VB-2W Vibrato is a pro league stompbox with all the necessary components and elements. Whether you are looking for a great vibrato effect that will last you a long time, or just something on a higher level of quality, Boss VB-2W Vibrato is definitely am model to put on your list. The last stompbox we want to talk about is the good old Dunlop M68 Uni-Vibe. In all honesty, this list just wouldn’t be complete without this pedal somewhere on it. Dunlop’s Uni-Vibe has been around for a long, long time. We are talking ’60s here. The fact that it has managed to cling on as one of the most trusty vibrato pedals on the market is just a testament to how sturdy Dunlop made this thing in the first place. Sure, it’s a revamp with some tweaks, but the core of this Uni-Vibe is still very much the same. The pedal is extremely simple, which is something a lot of users can appreciate. It comes featuring only three controls, and offers true bypass as a standard part of the package. 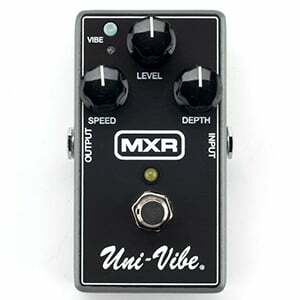 On top of that, Dunlop M68 Uni-Vibe is priced just right – not too expensive, nor too cheap. If you are looking for the authentic vintage vibrato/chorus setup, this is one pedal that can get you that type of experience and then some. Vibrato effect is a very interesting animal. Like we have mentioned at the beginning of this article, it is mistake for a tremolo and vice versa, way too often. There is an understandable reason for that confusion, though. These two effects are pretty similar. The main difference is that vibrato uses pitch shifting to create the wavy effect, while tremolo uses volume modulation. On top of that, vibrato effect actually sounds exactly like the sound you would get if you were to work the tremolo bar on your guitar. That alone is enough to confuse a lot of people. In practice, the main difference between the two is that tremolo induces a consistent frequency that retains those defined peaks and dips as it slowly dies off. On the other hand, vibrato achieves a more refined effect that is similar in nature, but much more organic. Because of that, vibrato is something you can use quite liberally in a variety of genres, where tremolo requires tempo alignment and other precautions to be taken into consideration. In all honesty, it can be really hard to differentiate between a tremolo and vibrate if you lack the experience in dealing with guitar effects pedals. With that said, the source of this confusion can be traced back to Leo Fender of all people. While he was a genius guitar builder, Leo wasn’t a musician. Because of this, he went on to call the whammy bar on his guitars as tremolo bar. As you can probably tell, the problem is that those trem bars aren’t really causing a tremolo effect, but a vibrato. Despite this technical error in labeling his products, the name tremolo bar stuck around causing many to associate the tremolo effect with a vibrato effect. Is it a big deal? Not really, but it can be problematic if you are trying to figure out which pedal you want to use in your gear. Speaking of using a vibrato pedal, there are some thing that we need to consider before going head first into the depths of this effect. The main trick to using a vibrato is to know how much is necessary to compliment the song. In other words, you need to figure out that line of saturation that is neither too much nor too little. Vibrato is one of those effect that can become tiring really quick. Most beginners make a mistake of going overboard with vibrato, thus completely ruining both the song and their perception of the effect. Moderation is absolutely the key. Here are some additional things to consider. The basic controls of all vibrato pedals consist of a level, rate and depth knobs. These are your core controls. The rate control determines the frequency of the vibrato effect. Since we are dealing with variable timing, one of the more important aspects of using a vibrato pedal is to find the right rate value. Best way to do this is to match it to the tempo of the song by either running a click track in the background or by using tap tempo on certain vibrato pedals. If you fail to do this right, the resulting sound will sound slightly out of whack. Also keep in mind that vibrato is shifting the pitch of input signal. This becomes even more apparent when you have a distortion involved or even an overdrive pedal. Playing around with depth is what really makes most impact on the guitar section you are playing. Depth control is what dictates how wide the pitch modulation is going to be. If we were to imagine the vibrato effect on a graph, depth would define the Y axis modulation. In simple terms, low depth value is going to deliver a more subtle effect, while going extreme with depth causes the opposite. How much depth you are going to use depends solely on your taste, preferences and what the song calls for. Once again, moderation is crucial although you definitely have some leeway. The main reason why so many guitar players aren’t that fond of vibratos is due to their approach. Vibratos come across as super simple to understand and use. That’s not really the case. Approaching them as simple effects leads fatigue. This is what usually happens. A guitar player gets a vibrato pedal, hooks it up, does a cursory overview of the controls and starts applying large amounts to his signal. As you can expect, this type of approach leads to fatigue very quickly. Instead, learning how to appreciate the subtle applications of a vibrato is what it is all about. Once you reach this level of understanding, vibrato ceases to be a basic effect and morphs into a very valuable tool. Some of the best guitar players in the world use vibrato in very small amounts. So small in fact that you can often barely sense it in the track. The thing with vibrato pedals is that they generally work great with other effects. As a matter of fact, if you apply a subtle amount of vibrato and layer it over other effects, you can get some pretty awesome results. You will rarely find a combination of effects pedals that don’t do well with vibratos. Naturally, you have to approach the whole thing with some common sense. This leads us to another point that is well worth mentioning. Vibrato pedals are best used occasionally. In other words, this pedal isn’t really something you would want to have on constantly. We have covered why quite extensively. The reason why we are talking about this is because even if you run into compatibility issues with other effects pedals on your pedal board, you can time them in a way where the two clashing pedals are not on at the same time. Since vibratos are fairly similar to chorus in a number of ways, we often see vibrato models that offer both. If you are looking to get into choruses as well, it is absolutely a good idea to look into these combo pedals. Sure, you may not get the complexity of modern standalone chorus pedals, but that extra versatility makes life that much easier. We have listed several such models on our tip list above, so if make sure to check those out. Choosing between vibrato pedals comes down to the regular stuff. To be more specific, your needs and your budget. You will find that there are plenty of affordable vibratos that won’t break your bank account. However, if you want to get into analog models, you can expect to pay a bit more. At the end of the day, getting one of the affordable models is well worth the investment if you are just dipping your toes to test the waters. In the end, vibrato is one of those effects that you don’t get to see too often, however it is making its way back into the mainstream. Just how practical vibrato can be is hard to describe since it can be used in so many different applications. If you are looking for a new effects pedal to spice up your tone a little, adding one of these stompboxes could be just the kind of solution you were looking for. All of the models we have shown you today are very much capable of giving you the necessary performance. That goes whether you chose to get the something as cheap as that Behringer, or as expensive as that Diamond. Decent vibrato can take you long ways.